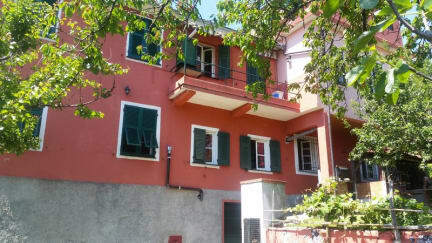 B&b Rifugio Uscio is in Uscio, 9 km from the sea near Portofino and Genova in Paradise Gulf Italian riviera. Is an old typical Liguria guesthouse(1920) totally restructured with mosaic floor. Good internet free wifi connection in all the house and in the garden. The area is Portofino Park, Paradise gulf and Tigullio Gulf very natural area near also to 5 terre ( 50 km ). 1 surf lesson or surf-kayak kayak or sup 25 euro, or discount 120 euro for 6 lessons with a champion of surf-kayak and his team: A wonderful and very good experience. Sonia es encantadora! Me habia perdido antes de llegar a Recco y la llame y fue muy amable explicandome como llegar y que autobus tomar. Al llegar a la parada de autobus me estaba esperando para ir al hostal. Luego fuimos a la playa y explorar el pueblo. Realmente me senti en casa! La casa es enorme con mucho espacio y el clima es divino. Un poco frio en la noche y calor en el dia. Definitivamente regresare! Great Stay in a beatuiful little village just 15 minutes car drive from the ligurian coast. I recommend to check out the surfschool in Recco if you like to learn surfing and all the surrounding villages and beaches. This was by far the best hostel I have ever stayed at! The location was incredible, gorgeous views of the mountains and ocean. Close to amazing pizza and convenience stores and a short bus ride to Recco beach. The stand out however was Sonia the host who's kindness and generosity really made me feel at home. I would recommend this hostel to anyone! Sonia was a brilliant host, the first day I arrived she forced me to head into Recco and go surfing which was so much fun. Such a charming little town, quiet with lovely scenery and everything you could need. Very easy to navigate to Portofino in an hour. I will stay again!!! My sister and I spent the weekend at B&B Rifugio and had a relaxing time. The hostel is perched on the mountainside with a beautiful view of the village & facing the sea. 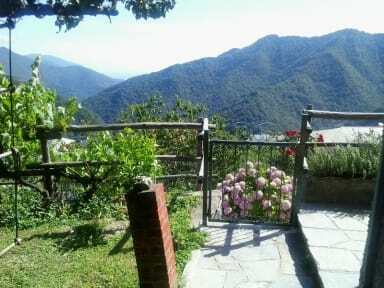 The location is great - in the mountains with authentic atmosphere, yet a short drive to Recco, along the sea. Sophi, the owner, prepared a nice and simple breakfast each morning with tea and coffee. Wifi worked well and it was a very pleasant weekend away. Cozy spot and nice host. I would recommend this place to a friend. B&B Rifugio Usico was an excellent place to stay in Italy. The staff was very nice and accommodating to English speakers. The breakfasts were delicious and the view was incredible. A great place to stay if you would like to explore Portofino at a more reasonable price. The staff had excellent recommendations on where to go and what to do. Would definitely stay there again! Great view, tasty breakfast and nice little village.